As UX professionals, it’s important that we stay abreast of the latest technologies and consider how they might impact UX design. So, over the past year or so, I’ve read more than half a dozen books, as well as numerous articles on various aspects of artificial intelligence (AI)—ranging from highly technical books for developers to more accessible works whose targets are business leaders, product managers, or even the general public. The most valuable of these books: Human + Machine: Reimagining Work in the Age of AI, by Paul R. Daugherty and H. James Wilson. This book is targeted primarily at business leaders and the professionals who influence them. Anyone who works for a corporation that deploys software to achieve its business goals would benefit from reading this book—and today, that’s just about every business. Those in government and education should also read this book. In addition to applying its lessons to their own unique contexts and ensuring that the workforce is ready to contribute maximal value in the age of AI, they can also influence business leaders to choose the right path forward at this critical inflection point. Does AI Threaten the Profession of UX Design? This book … allays concerns that machine intelligence might obviate the need for human designers. 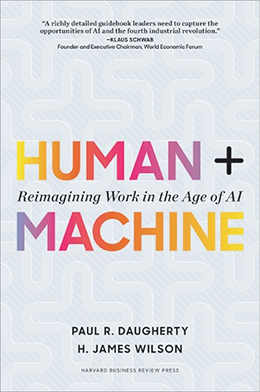 One reason it would be beneficial for UX professionals to read this book is that it allays concerns that machine intelligence might obviate the need for human designers. Likely, we’ve all encountered discussions of the threats that AI could pose to various professions, including UX design. I hold a more sanguine view about the value of human beings in the workplace and UX professionals in particular, and I’m not alone in that view. I’ll provide a brief overview of the book’s organization and content, sharing some key concepts. Introduction: What’s Our Role in the Age of AI? AI is now transforming business processes to complement and augment human capabilities. The first wave—Henry Ford’s deployment of the assembly line in 1913 launched the era of mass production in factories, with standardized, linear, step-by-step processes whose efficiency companies measured and optimized over time. The second wave—Beginning in the 1970s and culminating in the business process reengineering (BPR) movement of the 1990s, advances in information technology enabled automated processes in the back office. The third wave—AI is now transforming business processes to complement and augment human capabilities. In an emerging symbiosis between man and machine, “machines are doing what they do best—performing repetitive tasks, analyzing huge data sets, and handling routine cases. And humans are doing what they do best—resolving ambiguous information, exercising judgment in difficult cases, and dealing with dissatisfied customers.” These adaptive business processes consistently deliver better business outcomes. The authors’ research has shown that “the leading companies in various industries … are already riding the third wave. They have maximized automation and are now developing the next generation of processes and skills to capitalize on human-machine collaborations.” By leveraging real-time data, these companies are reimagining adaptive processes. The missing middle refers obliquely to the ability of AI systems to amplify human skills and collaborate with us to achieve huge gains in productivity that have previously been impossible…. Daugherty and Wilson introduce their concept of the missing middle—an unfortunately negative term for what is really a positive concept, so one that I think is unlikely to endure in the long term. This term refers obliquely to the ability of AI systems to amplify human skills and collaborate with us to achieve huge gains in productivity that have previously been impossible—a huge win. The authors refer to this concept as missing because few are even talking about it now and only a small fraction of companies are working toward achieving this goal. Figure 1 depicts the authors’ model of the missing middle, to which they refer throughout the book. Studying early adopters of AI has clarified the authors’ view of the future, enabling them to identify the different ways in which companies can fill the missing middle by creating new, enhanced jobs that deliver unique economic and employment opportunities. It is this missing middle that has resulted in today’s polarizing jobs debate, which pits humans against machines. The leading companies that are successfully developing next-generation, adaptive processes and the skills that are necessary to capitalize on human-machine collaborations are accomplishing this by adopting five crucial principles…. The books’ authors refer to these principles collectively as their MELDS framework. They cover the first four principles in depth in Chapter 7; the fifth principle, in Chapter 8. The authors explore AI in manufacturing and supply chain, in factories where humans are working in partnership with smaller, more adaptable, context-aware robots. They describe how flexible, highly productive human-machine teams “fulfill customized orders and handle fluctuations in demand.” This chapter also takes a quick look at the use of AI in unmanned vehicles and concludes with a brief history of AI. This chapter focuses on the role of AI in business processes and back-office operations. Daugherty and Wilson affirm: “AI technology can help filter and analyze streams of information from a variety of sources and enable the automation of tedious, repetitive tasks as well as the augmentation of human skills and expertise.” The authors consider how to determine what processes to change and how much to change—even to the extent of redefining an entire industry—and explore reimagining processes around people. The chapter concludes with an excellent glossary of the many AI technologies in use today—covering the machine-learning component, AI capabilities, and AI applications. The authors describe “how companies are using AI in research and development. In each major step of the R&D process—observation, hypothesis generation, experiment design, and results analysis—AI technologies can lead to increased efficiencies and markedly improved outcomes.” Sidebars discuss learning from failure, AI in product and service design, responsible AI—including ethics as a precursor to discovery—and AI in healthcare and life sciences. Daugherty and Wilson look at the impacts of machine-learning technologies on customer service, sales, and marketing. For example, Amazon’s Alexa, Apple’s Siri, and Microsoft’s Cortana “are increasingly becoming the digital embodiment of those companies’ well-known brands.” Sidebars look at AI in retail sales and AI in the sales and marketing process. In this chapter, the authors discuss the superpowers that AI can give humans, describing three types of augmentation through which “people are achieving huge performance boosts by working with AI technologies that dramatically improve their human capabilities; they amplify, interact, and embody new human potential. These new types of human-machine relationships are helping people … by offloading tedious tasks and by enabling them to perform their work faster and more effectively through the expert guidance, advice, and support from AI systems.” The chapter describes specific jobs for AI agents that amplify, interact, and embody. “Mindset—Imagine processes that might be.” “Executives must adopt the proper mindset, with a focus on not just improving business processes but rather on completely reimagining business processes and the way that work is performed.” They must discover, describe, co-create, scale, and sustain. “Experimentation—Imagine an experiment.” “[Executives] need to foster a culture of AI experimentation that allows them to quickly realize how and where the technology can change a process, and where it makes sense to increase the scale and scope of a process.” They must build, measure, and learn. “Leadership—Imagine a blended culture of people and machines.” “[Executives] must exercise the proper leadership in promoting responsible AI by managing the trust, legal, and ethical concerns that accompany AI and by considering the societal consequences of some process changes.” They must install guardrails, use human checkpoints, minimize protections for the technology itself, and consider legal and psychological issues. “Data—Imagine a data supply chain.” “Executives need to recognize the crucial importance of data, not just their firm’s own AI-enabling data but also the broader landscape of available data.” They must think dynamically, widen access and increase variety, increase velocity, enable discovery, and fill the missing middle. Fostering these fusion skills constitutes the fifth practice of the MELDS framework. This chapter looks at the fifth step that executives must take as human-machine collaborations become more prevalent. Daugherty and Wilson consider the future of work and hiring for and developing eight fusion skills that are essential to an AI workplace. Identifying “the concept of fusion skills—humans and machines coming together to [create] new kinds of jobs and work experiences [that form] the missing middle”—was a key discovery of the authors’ qualitative research. “Rehumanizing time—Reimagining business processes to amplify the time available for distinctly human tasks and learning. “Responsible normalizing—Shaping the purpose and perception of human-machine collaborations as [they relate] to individuals, businesses, and society. “Judgment integration—Choosing a course of action amid machine uncertainty. “Intelligent interrogation—Knowing how best to ask an AI agent questions, across levels of abstraction, to get the insights you need. “Bot-based empowerment—Collaborating with intelligent agents to punch above your weight at work. “Holistic melding—Developing mental models of AI agents that improve collaborative outcomes. “Reciprocal apprenticing—Teaching AI agents new skills while also undergoing on-the-job training to work well within AI-enhanced processes. The book’s back matter includes a brief postscript, quite extensive chapter notes, a detailed and thorough index, acknowledgments, and author profiles. UX professionals can provide user interfaces that visually communicate how AI systems make decisions and the many factors they take into account, thus creating transparency and engendering greater trust of AI systems in humans. Human + Machine provides a clear, perceptive analysis of the current state of AI in a variety of business domains—and numerous, inspiring examples of businesses at the cutting edge of AI. Its authors, Daugherty and Wilson, make a compelling case for their vision of possible future applications of AI that would transform business, and they offer practical advice for organizations that are ready to embrace the future that only partnerships between humans and machines can deliver. This book communicates an essential message to leaders in business, government, and education. If we get this transformation right, AI will enrich the lives of workers and deliver superior business results to the companies who fully leverage AI. If not—if business leaders cling to the obsolete model of driving ever greater efficiencies, cutting costs, demanding increasingly high levels of productivity from their employees, and emphasizing profits over all else—we’ll find ourselves in the midst of a socioeconomic crisis. This book has gotten an encouragingly positive response from the business community and technologists—check out the six pages of endorsements at the front of the book. We must create a future that ensures everyone benefits from the power of AI. This book shows us how to do it. Daugherty, Paul R., and H. James Wilson. Human + Machine: Reimagining Work in the Age of AI. Boston: Harvard Business Review Press, 2018. Kucheriavy, Andrew. “Artificial Intelligence Will Take Your Job: What You Can Do Today to Protect It Tomorrow.” Forbes, February 26, 2018. Retrieved February 1, 2019. Pew Research Center. “Artificial Intelligence and the Future of Humans,” PDF. Pew Research Center, December 10, 2018. Retrieved February 1, 2019. Rosenblatt, Gideon. “Artificially Intelligent Design.” Vital Edge, August 20, 2018. Retrieved February 1, 2019. Wikipedia. “Douglas Engelbart.” Wikipedia, undated. Retrieved February 1, 2019.